Don't be afraid to dream big. 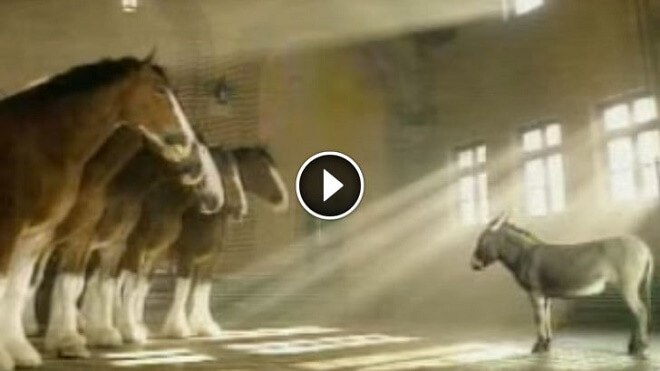 That's the lesson we should all learn from this heart-warming commercial from a while back. See, all this little guy ever wanted was to become a Clydesdale, but alas, that was one job he didn't qualify for because he was born a donkey. Still he practiced his walks and even hilariously tried his best to look like a Clydesdale. Eventually he got his big shot at a job interview. Faced with the most majestic of Clydesdales he had to present himself in a way that would blow them away. And boy, did he ever?